Hello guys! I wanted to post a new entry right after the Lifehouse concert last Saturday but I was so tired (not really) that I just surfed the net when I got home at 12 in the morning. Hmm, actually I should’ve slept, but no! Hahaha. It’s becoming a bad habit, actually. 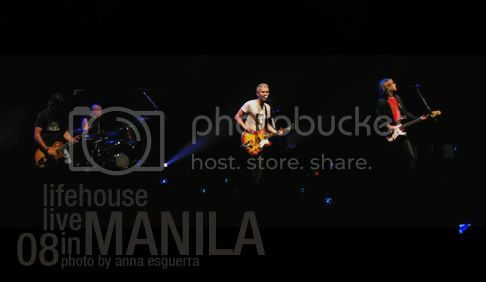 Continuing my story.. Last Saturday Alex and I went to Araneta Coliseum for the 2nd time to watch Lifehouse! I got to buy tickets a month early, but realized when we got inside the stadium that we got the wrong patron section tickets! I bought PT106, which is one patron box farther from the stage, should’ve been PT107 instead since it’s closer. Rawr. But it’s okay because I got to record good audio from the videos I have from the concert here. Yah, well, IDK if I’ll post them online.. seems like there’s a lot of better videos on YouTube. So much for regretting. We got there 15 minutes before 8PM, according to the ticket it’s supposed to start ‘on time’ but Lifehouse came out at quarter to 9PM! WTF. On with the show, the people cheered, of course. 😛 I was happy to see the band infront of me. Sad to say I didn’t enjoy it THAT much. I mean, it was OKAY… but of course, more of like ‘it could’ve been better’ if only they also played ‘Everything’. Everyone was anticipating to hear Everything live, most of the people kept on chanting it but according to a forum Jason Wade (vocalist) was not aware that the song is a big hit here. Ouch. They definitely owe us that song, and I sure hope they will come back here after 4 years or so. I hope you guys now know what my post’s title means. I don’t mean it in a literal sense. I was talking about the song. Look it up at Imeem, it’s a beautiful song and I recommend it to everyone. Here’s the setlist of the songs they played, I got it from the official Lifehouse thread at PEx Forums (bolded songs are the ones I know). In my opinion, I think the night would’ve been super amazing (sorry for the lack of a much ‘cool’ term) if they played the following songs live: EVERYTHING, Breathing, Cling & Clatter, Chapter 1, Come Back Down, Only One, Sick Cycle Carousel & Walking Away. I didn’t get to sing to much of the songs, even to the ones I know, sad. 😥 Yeah concerts are definitely fun if you can sing to most if not, ALL, of the songs they play. It’s more exciting, enjoyable, memorable that way! Actually, all those are my favorite songs from them, HAHA! Biased, much? It’s okay.. all in all, I’m contented with the Lifehouse experience. Better experienced than regretting not going that night, right? I saw some familiar faces that night as well! Joaqui Mendoza from PBB was with a girl that night, I dunno who she is. Two tall *cute* (no to me) college, athlete-looking men.. they look like their UAAP players or some college heartthrobs, LOL. Cause I saw some high school girls going to them to get their picture taken with them, hahaha. That’s so highschool! Jk. Anyway, your lucky to have seen them. They’re amazing. I was kinda shocked nga when I saw your title. I thought this was a hate post on the concert or something then I read the post and I was like, “ahhh Everything the song! !” hahaha naks. wow mukhang ang ganda ng concert ah ako never pa akong nakapanood ng concert! yeah! they owe us everything have you heard they wanted to come back here? that’ll be good eh? hehe. grabe..I love them so much but why didn’t I hear of that! 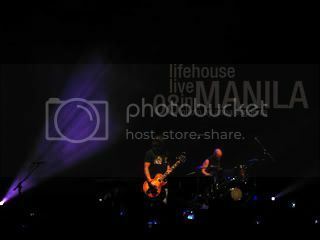 LIFEHOUSE! 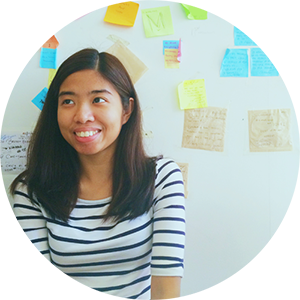 Natatandaan ko, namroblema ka pa nun sa Plurk kung sino maghahatid sa yo sa Araneta. HAHA! Oh well. Oo nga. Sayang walang Everything. Aww. Oooohlala, i love the pictures. Galing mo talaga kumuha ng pics. Nakakadazzle. Wow, you’re a happy fangirl! 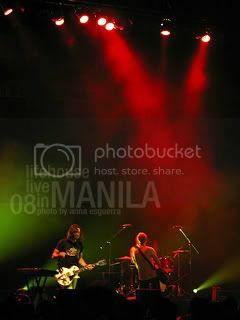 You can watch all your favorite bands here in Philippines, very lucky anna! Haha, by the way, ang cool ng shots~ Crush ko yung Rick haha~ And yun nga lang, you can see alot of posts from your multiply friends with almost the same title and of course, event. It’s too annoying na rin minsan so it’s better to lock entries.. blah. See you around school. Encoding next week. btw, the pics are awesome! Aww they didn’t sing Sick Cycle Carousel? 😞 It’s the best song ever. Oh,it must be great! Omg! lifehouse?Well I do love and Idolise them! Oh,Alrenz is right,there are a lot of concerts that are following,haha,I wish I was there even a minute. nice naman sana tinake home mu na rin sila para suilit na sulit! lmao. yes, ako pa rin owner, why do you ask? 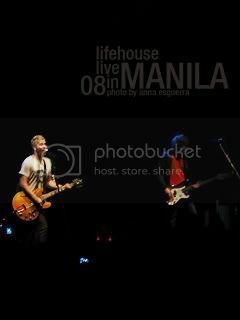 I love Lifehouse too. 😊 Especially their songs Hanging by the Moment, Whatever It Takes, and You and Me. And I do wish they played Come Back Down. I love that song. HAHA. As if naman I went there noh. Lol. Wow. Buti you went there.